Duravits bathroom furniture series L-Cube is presented in a puristic design. The bath furniture, designed by Christian Werner look timeless and elegant. The furniture develop by its smooth surfaces a calm mood, which is perfect for your relaxation time. Both, design and functionality are kept simple. For example, you can see it at the shadow gap. Overall, you can choose from 31 colors and different finishes such as melamine, lacquer or real wood veneer. Duravit L-Cube completely dispenses with handles. The series shows puristic beauty in design. Through the innovative tip-on technology, you can easily open the drawers with just one finger, one touch. Minimalistic luxury perfectly combined! In our shop you will find a wide selection of diverse colors and surfaces. You can choose from a total of 31 different color and material combinations. Choose the right bathroom furniture between 11 resistant wooden decors, 6 surface-finished real wood veneers and 13 high-quality lacquer surfaces. This creates a perfect harmony of touch and color. In addition to your outstanding quality, the L-Cube range of bathroom furniture is particularly impressive thanks to the wide range of options available. From the washbasin cabinet to the bathroom mirror, the design line offers you an extensive assortment in numerous sizes for the complete furnishing of your bathroom. This is how you create a designer bath in a uniform puristic shine. Cabinets in mid high, high, and in various widths offer plenty of storage options. Whether in 700 x 243 mm, in 500 x 363 mm or with one or two doors, choose the perfect cabinet for your bathroom from the series L-Cube.ext. Well, if you have a shelf, where you can store the various shower utensils. Here you can choose between vertical shelves (180 x 180 mm) or horizontal shelves with a width of 800 or 1000 mm, with a height of 140 mm. The various versions of washbasin substructures (wall-mounted) are available in the width from 520 mm to 1290 mm. At the height you have the choice from 294 mm to 534 mm. For standing vanity units, you can choose between a width of 320 mm to 1220 mm. At the height you can choose between 391 mm and 547 mm the bath fitting. Also for the consoles of series L-Cube there are vanity units. With a width of at least 320 mm and a maximum of 1020 mm, with a minimum height of 477 mm and a maximum height of 547 mm. You can also select a console with cabinet in various colors and dimensions of a minimum width of 320 mm and a maximum of 1020 mm. At the height you can find the perfect console with base unit for your bathroom between at least 477 mm and a maximum of 547 mm. 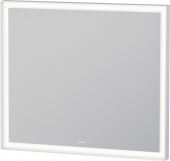 Mirror with lighting are available with a width of 450 mm or 2000 mm and a height of 67 mm. Or should it be a practical mirror cabinet with a width of either 650 mm or 1200 mm with a width of 154 mm? Also montage frames are available for your dream bath. With a minimum width of 700 mm and a maximum width of 1250 mm with a constant height of 10 mm you can design freely. 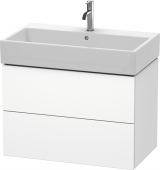 Duravit L-Cube washbasin cabinets and consoles can be combined with various washbasins. The furniture from the L-Cube series is connected to the ceramic DuraCeram®. However, you can rely on robustness and stability. 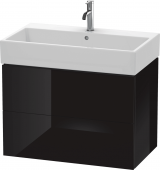 The c-bonded furniture washbasin and substructures is wall-mounted or floor-standing. The designs are available with a minimum width of 800 mm or a maximum width of 1200 mm. You can also choose between a height of at least 480 mm and a maximum of 540 mm. L-Cube has a clear structure and a harmonious design, cause of that L-Cube is always aesthetically.